Sidney Stratton (Alec Guinness) has a dream: to develop a fabric that never gets dirty and never wears out. His textile mill bosses discover his secret experiments and initially ban him from their laboratories. But when Daphne (Joan Greenwood) comes to understand what Sidney is trying to do, she convinces her father, Mr. Birnley (Cecil Parker), that developing Sidney’s fabric would be great for business…and mankind. Little do they know that they will spark an uprising, not only among the textile workers who would lose their jobs to the ultimate cloth, but also the business owners who would rather maintain the status quo. 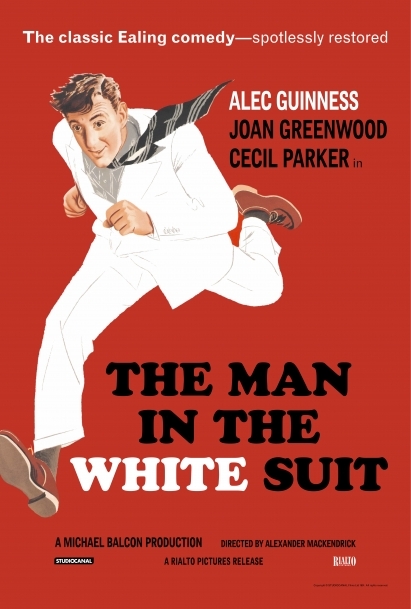 "Both the funniest and most demoralizing of the great fifties Ealing Studios comedies." "THE EALING COMEDIES DIDN'T COME MUCH BETTER!"